I am still redecorating my new dorm room. It takes a lot to make it a cosy and comfortable nest. :) Today I installed my new cork board to put my timetable and some little funny things up there. 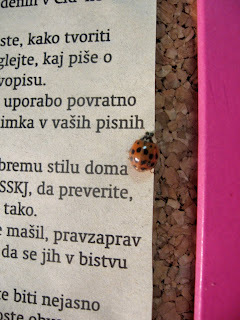 Obviously my notes are very interesting because a visitor already came and started reading "27 directions for better Slovene" article.